How many critics of neoclassical economics have heard of Resource, Events, Agents? It is important because it offers a way of doing mathematical modelling in economics that meets the Lawson critique. The Lawson critique is as important to economics post crisis as the Lucas critique was before. Here is a video summarising his ideas. In it he is very critical of George Soros (I wonder how long his profile will remain on INET, I jest its long been made by him) for perpetuating the focus of economics on mathematical modelling. You can find a paper from him with a good summary here. See also his much cited 2009 paper. The widespread and long-lived failings of academic economics are due to an overreliance on largely inappropriate formalistic methods of analysis. This is an assessment I have long maintained. Many heterodox economists, however, appear to hold instead that the central problem is a form of political-economic ideology. Specifically, it is widely contended in heterodox circles that the discipline goes astray just because many economists are committed to a portrayal of the market economy as a (overly) smoothly or efficiently functioning system or some such. However his criticism on formalistic modelling is just an outcome of his ontological critique. Lawson (correctly) argues that a discipline is defined by its ontology. By ontology we mean the representation of reality. Lawson argues that mainstream economics has adopted an ontology from physics where objects are modelled as atomic and that this is inappropriate to society – which is characteristised by open systems, emergent phenomenon, structured & internally related processes, that as procoessual in time. Certainly this has been influential – see Fullbrooks book length treatment of the debate he triggered. Lawson applies many of the developments in wider social theory to economics, especially Bhaskar’s realism. I have no issue with this. My own approach as someone coming from the humanities to economics is based on my shock at how little orthodox economics has been influenced by modern social theory and its thinking on the structure – object relationship. (see my paper on DGSE here). One might argue that his characterization of orthodox economics being based on an ontology of isolated atoms is unfair to modern physics which has long broken from this classical straitjacket. indeed many of those coming from physics to economics are heavily influenced by complex systems theory and are highly critical of the primitive and inappropriate use of maths in orthodox economic modelling. My critique of Lawson is that his correct ontological critique is inconsistent with his dismissal of formalistic mathematical modelling. The problem is not formalism or modelling, we could do with a lot more formalism and modelling providing it is based on ontological foundations that equate to real economic relations. Lawson dismisses the thesis that the problem is of political economy ideology. However the political economy and ontology are indivisible. A good example comes from a domain where Lawson in his UCLU talk linked to above gives as a good example of where mathematical modelling can apply is traffic jams. How ironic as queuing theory, which is used to model traffic, is a good example of disequilibrium theory that can be applied to economics. The compression propagates backwards, traffic backs up, and a jam emerges. In due course the jam clears. But notice three things. The phenomenon’s onset is spontaneous; each instance of it is unique in time of appearance, length of propagation, and time of clearing. It is therefore not easily captured by closed-form solutions, but best studied by probabilistic or statistical methods. Second, the phenomenon is temporal, it emerges or happens within time, and cannot appear if we insist on equilibrium. And third, the phenomenon occurs neither at the micro-level (individual car level) nor at the macro-level (overall flow on the road) but at a level in between — the meso-level. Here we have an open systems emergent phenomenon, with structured & internally related processes, that as procoessual in time – meeting all of Lawson’s characterisations of social ontology – that can be fully captured in a mathematical model. The problem, as i have argued recently here, is that the neoclassical system is based on a building block of intertemporal optimisation by isolated agents and that this is not at the correct level, correct ontological level if you will, for mathematical modelling. I argue instead that the foundational building block of modelling should be fundamental accounting constraints of economic systems (Capitalism in our case), constraints which frame the economic decisions of agents. There are those that argue (Ricardo Reis for example) that accounting is just a legal relation and too inconsistent in conventions to form any part of economic theory. I respectfully disagree. Accounting was not created on a legal whimsy but to enumerate profits and losses. It is a model of reality. Reis argues that consumption theory is based on inter temporal optimization of past and future consumption of real resources not requiring money at all and so balance sheets are simply totting up, rather than constraints. This arguments is part of the malaise of economics in denying its monetary production nature. If you are producing goods a and b consumed at different times and need to borrow to buy capital goods to produce goods a or b and these depreciate at different rates, then the independent variable and fundamental constraint is not the preference for goods a or b at some future point in time (a fixed factor depending on price) but rather the optimising problem between the price and quantity of the two capital goods and the price of money (interest) in order to maximize profit. This is the decision that determines where in the demand schedule the consumption takes place at and when. Reis’s argument confuses between the fundamental accounting relations of capitalism and the social and legal norms under which they are applied. There are those that have called for a merger between accounting theory and economic theory. Steve Keen for example, I would echo that. Indeed there has been quite a lot of work on ontology in accounting theory. I would argue that accounting theory has undergone four paradigmic shifts. 1. The widespread use of double entry accounting from C12 onwards (though I like many historians argue that Venice was just the conduit for such methods from the classical world, wherever there was banking there is some evidence of double entry) – central to the foundations of capitalism. 2. The formalisation based on the fundamental equation of accounting and the mathemtisation of depreciation introduced in the US at the end of C19 to cope with the scale and challenges of accounting for huge corporations. 3. The introduction of cost accounting and return on equity by GM in 1923, later developed by DuPont. 4. 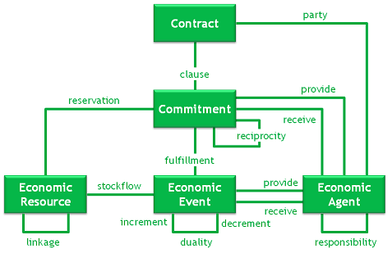 The invention of Resource-Event-Agent accounting model by William E. McCarthy in 1982 to modernise accounting to be able to use computer modelling of actual events. There is some irony that although economics (at least PK economics, and some notable thinkers such as Buiter and Haldene) are using balance sheet based models its seems so far to be only up to stage 2 of these 4 (I can only think of Scott Fulweiller who uses cost accounting thinking). The beauty of the Resource-Event-Agent model is that it is a tool that helps us model whilst meeting the Lawson Critique. It can provide the necessary bridge between stock-flow consistent modelling and agent based modelling. REA then builds a process model of the interaction of these elements. As below. Sometimes it is announced with some hyperbole that credits and debits and with them double entry bookeeping disappear in a REA model. This is incorrect. You will find in computer systems that adopt REA the fundamental equation of accounting everywhere. What does disappear is some accounts as persistent objects like the general ledger – they are just reports. Some accounts are however real objects in that they are used by agents to make decisions – such as the profit and loss account. There is also some hyperbole over REA replacing assets and liabilities with real world resources – so you don’t need goodwill for example. But goodwill though intangible is real. Intangible assets are the source of profits- embedded in the real practices and positioning of the firm – – as I argue here. Try producing an REA model of the valuation and sale of a company without treatment of Goodwill as a resource. So it is possible to meet the Lawson critique and use models, of a very different kind, in economics. Though it is very early days in developing a satisfactory modelling methodology that is ontologically satisfactory. You would never see that structure in a real systems design designed to model economies. It is far too fiddly and the viewpoint is firmly on a business. But they are bit part players in an economy that come and go as required. The correct approach IMV is to start with the closed entire world and decompose it down via interacting currency zones until you get communicating objects operating within and between those zones. There are at least three object meshes that represent the stuff we manipulate, the manipulators and the dynamic currency systems we use to glue the two together. Those need to be constructed in a three dimensional space somehow so that we can zoom in, zoom out and swivel it around to get the viewpoint from any particular entity. You then derive the accounting ledgers from the messages flying around within those meshes. The balance sheet is just a record of the state at an instant in time. The profit and loss the state change between two instants in time. The model required has more in keeping with massive multi-player online games than any dry accounting theory. We need a simulation where we can become any entity. Only then can we check whether the system view from that entity fits what that entity experiences in the real world, and see if the emergent properties from the interactions mirror real life. You are right that the REA framework is too fiddly at that level of detail which illustrates the challenge to integrating agent based modelling with modelling at higher levels of aggregation. The beauty is that you can aggrateg Resources, Events and Agents at any level of aggregation that makes sense and produces balance sheets which affect agency, otherwise it wont affect ‘economic decisions’ to use Menger’s term. Aggreation around factor returns (classes) is a good starting point.